Eric Robot to be reborn! "As the UK's first robot, Eric has a unique place in history. With your help the Science Museum is bringing Eric back to life." "Built in 1928, Eric holds a unique place in our history. He was everything we now imagine a robot to be – a talking, moving mechanical person. But then Eric disappeared and no-one knows what happened to him." A replica of Eric has been successfully funded by the first ever crowdfunding project undertaken by the London Science Museum. Over a period of a few weeks in June, a remarkable 861 people have pledged £51,813.00 to save Eric for the nation. The replica is now being built by expert roboticist Giles Walker in London from archive documents provided by us during the next few months and then Eric will be saved for the nation and become part of the Science Museum's permanent collection. We are hugely excited and delighted at the outcome of our communications with the Science Museum over the past two years. The Robots exhibition is now open, to great aclaim! ​​Photograph: Seen at special preview of Eric's progress 6 July, 2016 in London. 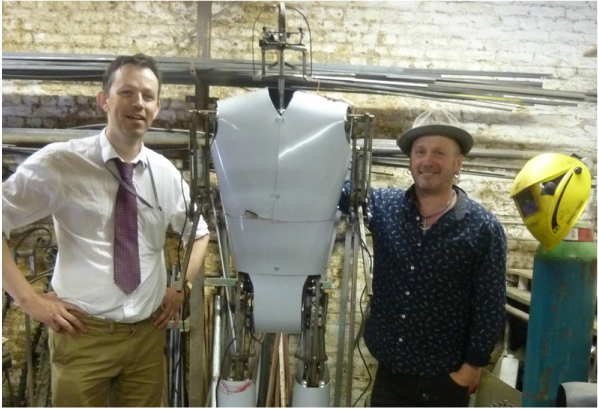 Left, Ben Russell, Curator of Mechanical Engineering and lead curator for the Robots exhibition with Replica Eric centre and his builder Giles Walker on the right.